I HAVE been unfair when it comes to reviewing ramen joints in Sydney. Unfair because I have neglected Menya Ramen Bar in Sydney’s Haymarket. Menya is a place that I eat regularly when I get a ramen craving (which is often as it is now winter in Sydney), was the first “ramen bar” I ever went to in Sydney and is a place that I consider offers the best value ramen in Sydney. It’s also has my favourite ramen – the Menya tonkatsu shoyu ramen – and at a mere $9.30 – it has a lip-puckering flavoursome soup with tons of toppings. When you enter Menya at the bottom of the Princes Centre in Haymarket you are always greeted with an enthusiastic “Irasshaimase!” by the chefs. Always. And that gives me a renewed energy to battle for a place along the bench at its long communal dining table with other ramen slurping Menya groupies. The menu has a variety of ramen in four base broths – tonkotsu shoyu; tonkotsu miso (the pork bases); tori-gara shoyu and tori-gara miso (the chicken bases). Apart from my favourite (which I will get to later), you can choose from the ton-toro ramen (roasted pork); karami ramen (chilli pork mince); kogashi-ninniku ramen (garlic) ni-tamago ramen (with Japanese gooey eggs); teriyaki beef ramen; tori-katsu ramen (chicken schnitzel); and tori kara-age ramen (fried chicken). There is also the dragon jya-jya men with chilli miso pork mince and the karami-miso tsukemen. 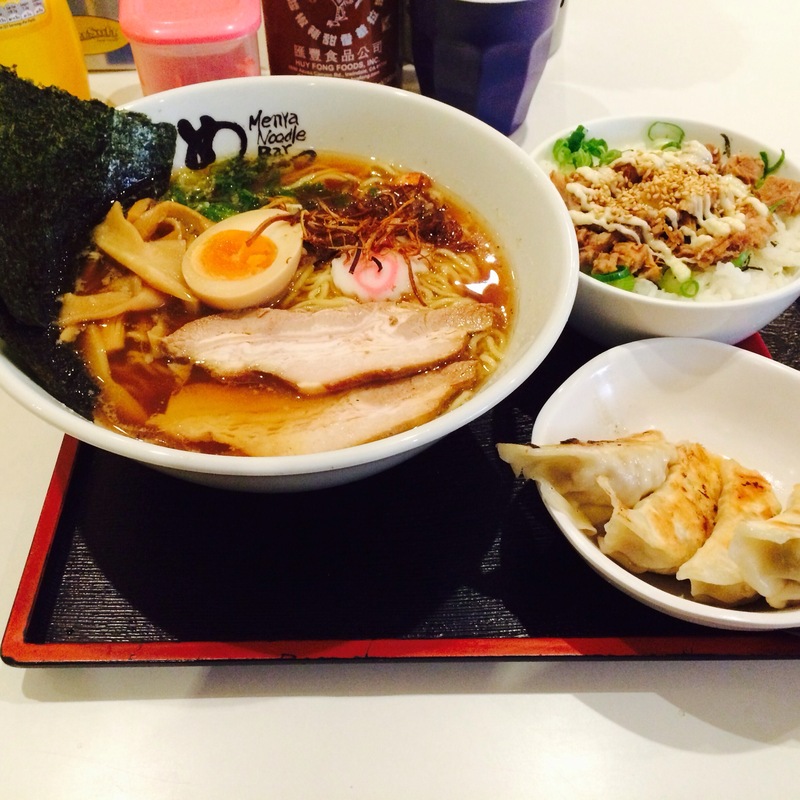 Menya also has a selection of soba and udon noodle soups and a selection of rice dishes and sets. My favourite, Menya tonkatsu shoyu ramen is packed with a flavorable tonkotsu pork broth with all the ramen toppings you need (char siu pork, frim noodles, half a tamago egg, narutomaki, menma and two seaweed sheets). It’s hearty, filling and comforting on a cold winter day. If you have a big appetite (and you are going to need it), then a deluxe mini Menya ramen set is the way to go. The set offers a choice of either a tonkotsu or tori-gara based menya ramen; a plate of four plump gyoza and a choice of one of four rice bowls (menya curry; buta mabushi; teriyaki beef or chanko). I tend to choose the mabushi bowl (which is pickled pork) with the lighter chicken-stock based tori-gara ramen but if you have a sumo-sized appetite then you may have to have the protein rich chanko bowl (which is what the sumo eat) with the tonkotsu! 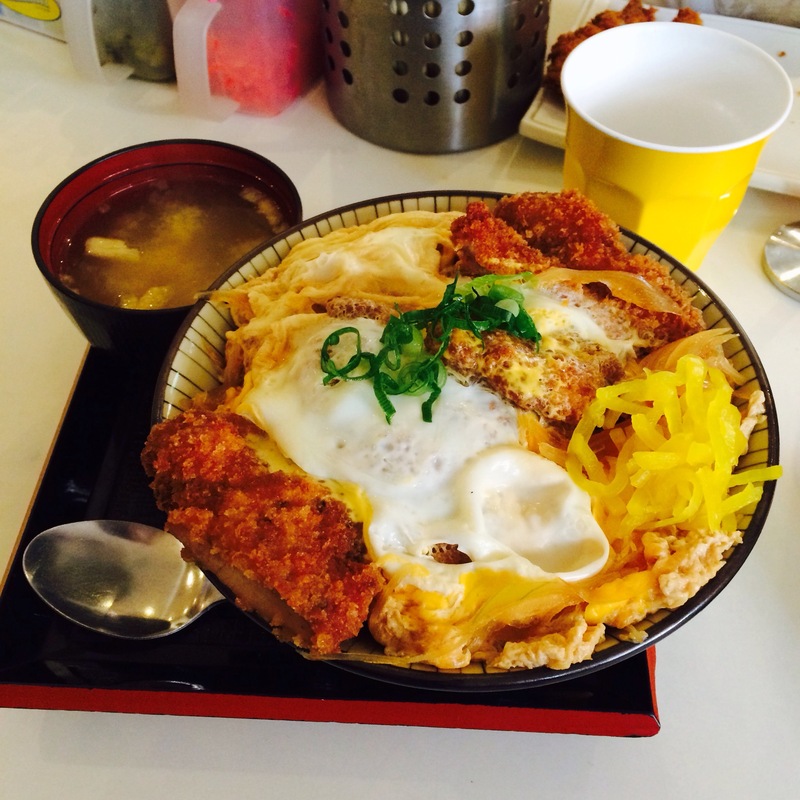 If you’re not in the mood for ramen then I recommend the katsu don with miso soup ($9.50). Here you are offered a large rice bowl topped with a fried and well-seasoned chicken schnitzel which has a crunchy coating and juicy chicken inside. It’s topped with an egg that is baked onto the rice and chicken. The bowl is perfect for the kids to share! For an extra $4.50 you can get a Menya ramen on the side but I have seen folks order such an addition and they struggle. If you like noise, love to slurp and don’t like taking out too many notes or coins from your pocket – then Menya is perfect for you. The verdict: Be aware that Menya is cash only and has communal tables and is busy during peak eating times (but turnover is fast). Service is quick and in no time you are slupring firm noodles covered in a silky tonkatsu broth. 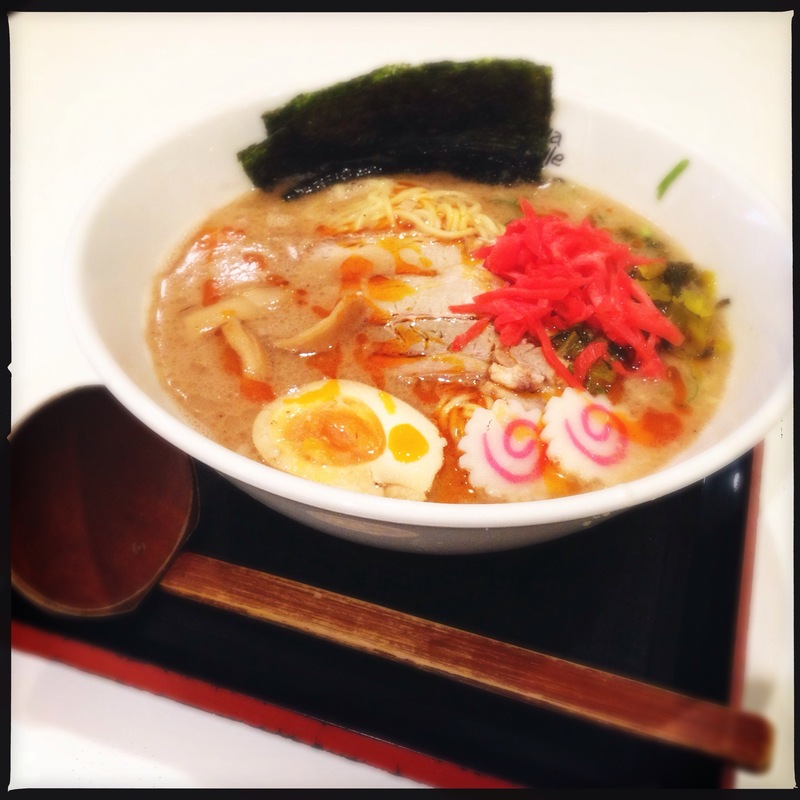 What: Menya Ramen Bar, Shop TG8, 8 Quay Street, Haymarket NSW, Australia. This entry was posted in Japanese, Menya, Ramen, Sydney and tagged Japanese, Menya, Ramen, street food, Sydney. Bookmark the permalink.